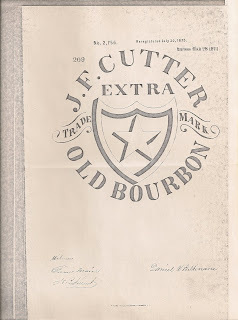 Here are a couple of containers for Jesse Moore Old Bourbon from the Moore, Hunt Co.
As has been bantered around on this blog, Chielovich was replaced as agent for Jesse Moore Whiskies in 1875. Hunt was brought on board as a partner in 1876. Dale's set of Jesse's...... NICE! A.P. Collection. All were dug by him! The non vented variety were probably in use approx. 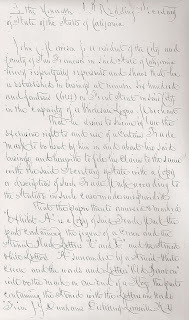 1876?-1878. As was commented on, notice the fairly tight color range for this fifth. 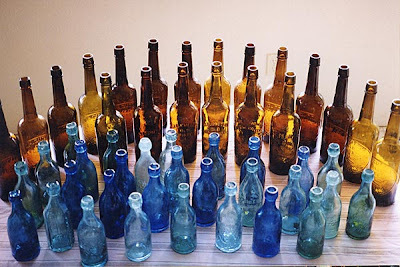 Was George Moore that fussy about the bottles used for his product? The typical glob top Jesse Moore fifth(t-94). Large blob air vent between antlers. This is the glob fifth we all cut our teeth on. They still look pretty good to me. Nice large top, and all of that writing. Probably in use from 1879 or so through the mid-1880's. For collectors that haven't really ever paid attention to the difference in the two varieties of the Jesse (t-94) fifth, see if you can find one of each to compare, side by side. That big air vent makes a large difference in the overall glass character of the bottle. We need a photo of the whittly red amber version of the bottle. Anyone have a nice globby red amber? Time for the real Clubhouse Hall of Fame. Oh, and congrats to the newest owner of a CCH. Dave B.
Dave lives just up the road a piece, I like to say in the Park City suburbs. Dave, I hate to tell you this.. but guardianship of one or even two CCH fifths is not automatic inclusion to the H.O.F. Don't fret too hard, I'm out of luck as well. The member list of the CCH HOF is pretty darn short!! President and Founder: JOHN C. MORRISON JR.
A true Argonaut, Morrison arrived in San Francisco on June 4, 1849 aboard the Steamship Panama. There were a number of soon to be important people aboard the Panama. William M. Gwin became U.S. Senator, Fred F. Low served as Governor of California, and of course most important of all was our boy Jno. 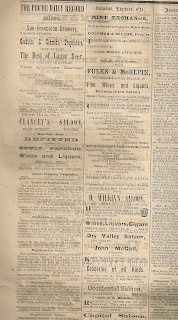 C. Jr.
Morrison bounced around early San Francisco as a commission merchant and during the early 1860's he formed partnerships with several different people and operated various wholesale liquor establishments. 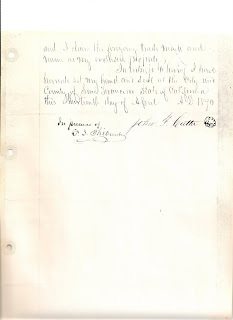 In March of 1866 he dissolved the partnership he had with A.J. Bryant and hung out his own shingle at 614 Front St. 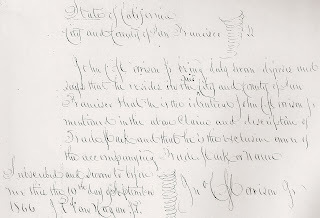 In 1866 he registered the Dunham's Old Bourbon with the State of California. Later he trademarked 4 other brands with the State. His "Stag Whiskey" is the brand most often seen in advertising. 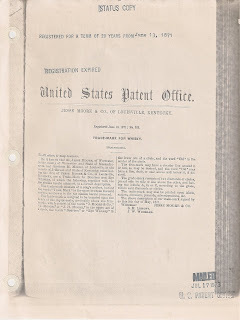 It was registered on March 8, 1870. By this time Morrison was located at 316 Sac. Street. 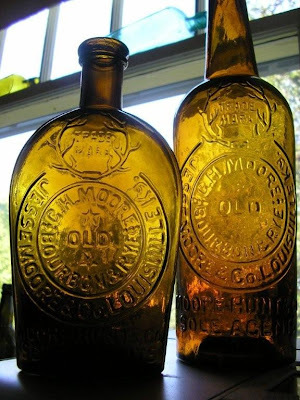 On June 21, 1872 Morrison trademarked the Club House Whiskey brand. J.C. Jr. also had a risk taking appetite for mining stocks. It got him into trouble in the 1860s but in the 1870's he hit it big. VERY BIG! He was a major owner of stock in the fabulous Consolidated Virginia and California mines in Virgina City, Nevada. Morrison invested $269,000 of his own funds in the development of the Dividend Block on the north side of Pine Street. He is listed as a liquor dealer at the 316 Sac. 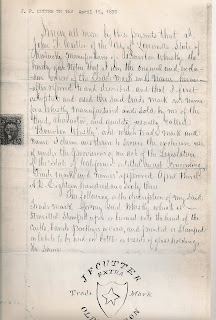 St. address through 1878, however his obituary states that he joined the firm of Moon, Scalley & Co. in 1873. After 1877 his is simply listed as a "capitalist". A man with money! He had a love for horses, particularly Roadster horses. He died May 17, 1881 at the age of 58. Interesting sidebar, on Jun 4, 1874, they held a 25 year reunion honoring the Pioneer Steamship Panama passengers. There were 23 former passengers in attendance at the gala event held at the Grand Hotel. Gwin and Low were there, along with the pomp and ceremony politicians love to surround themselves with. But we all know now who would someday be the most famous person to attend. Besides, he probably brought the booze. John Thomas, whiskey bottle historian. 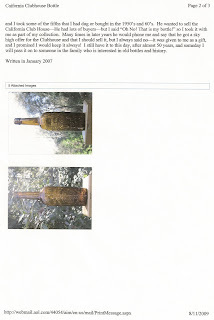 Author of several books on western whiskey bottles including the standard work WHISKEY BOTTLES OF THE OLD WEST first written in 1969 and updated in 2002. John's favorite old glob was undoubtedly the Clubhouse. He owned two of them over the years and possibly guided others to top collections of his era. He has been accused of promoting the Clubhouse a bit too much and helping it along to it's status of the #1 fifth. Maybe, I believe it can pretty well stand on its own with most collectors. It does have one grievous problem, that holds it back just a bit with some old school collectors... The words SOLE AGENTS do not appear on the fifth. Sorry John, but they don't!!! Saline Valley. One of the great digging stories of all time is attached to this beautiful example. Even reported in the Old Bottle Magazine in 1971 I think. 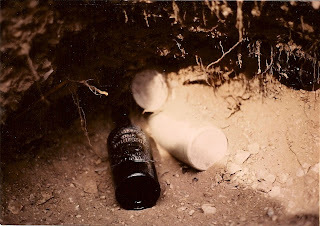 Paul Bagwell and wife June were another bottle digging couple in the Bishop, Ca. area. 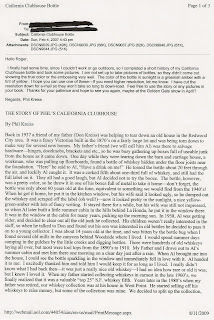 Paul dug a number of good bottles, Eastern California was 'good ground' if you collected whiskey bottles. He liked to scout out areas off the beaten path, particularly small "charcoal burner" camps. I have been told that Paul liked to identify likely spots on the mountain side by the glint of broken glass in the sunlight. He would drive as close as he could and hike in the rest of the way. Sometimes a narrow wagon road or mule trail might lead into these small camps. The silver/lead ore of the area demanded a huge amount of charcoal for smelting purposes. Small two or three man charcoal burner camps dot the mountain sides near the mining regions. These burner camps were usually only manned for a few weeks, then the burners moved on to find more wood to burn. Paul and June drove to a camp he had spotted one morning in 1971. Just another small camp that might have a few bottles, probably all broken in the rocks on that steep mountainside. He was digging away in the the trash layer in and around the burners flat and not finding much. 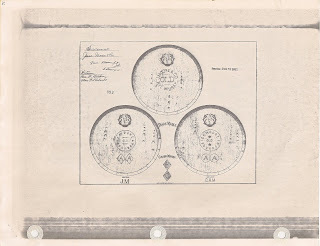 He mentions in the article that he found several stemless pipe bowls with the initials P.B. on them. Hmmn, good luck maybe. No bottles coming out. June spent an hour or so enjoying the clear view down on the valley. Read a little from a book she brought along, had a bite to eat. Went for a little hike down the hill. "Paul, are you finding anything?" "Not a thing, not much here. Maybe we should try somewhere else." "Paul, I found a bottle ....."
"What did you find, dear?" "Oh, this green whiskey bottle that was stuck in that big sagebrush down below the flat." "Green whiskey bottle, ok dear, does it say anything on it..."
"Paul, here, look at it, it says California Club H..."
The scene could never be effectively put to story. It would have been a sight to see. I have been told that for a few days Paul thought he had been "had" "duped" with a fake bottle, someone had put June up to the big scam. Nope, it was the real deal! A survivor! A charmed bottle! Stuck in the brush on that steep mountainside. Just a few years later Paul died of cancer. The bottle was purchased by M. Boone, a high flying bottle promoter of the day from Las Vegas. Booner was the king of whiskeys for a minute or two, then flamed out and sold out. He had just sold the Club House and a few other bottles when his place caught fire and burned to the ground! Everything in it was lost, including quite a few good glob top whiskey bottles. The 'charmed bottle' was long gone! Safe in the hands of another collector. Beer label town. 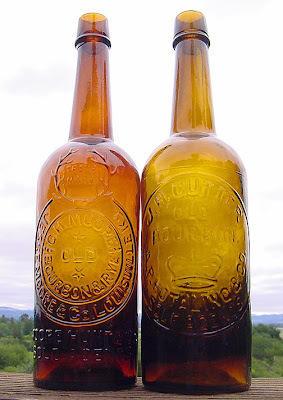 Lou and Dorthy were involved with the Bishop Bottle Club. They were fairly green as to digging, and sought the advice of some of the early Bishop club members. Adele Reed and others. The many towns around Beer label town had been dug pretty hard, even by the early '60s. Beer label town had not. It was a tough town... flash flood central. Holes were very hard to locate. Lou figured it out, and absolutely loaded up on fifths. err-beers. When word of the Club House came out, they were inundated with offers. Dorthy was very opinionated, she hated waking up and finding Thomas and his little VW in the driveway. Doc. Rittenhouse, so on, all the players of the era gave her heartburn. She hit it off with Allen Wilson. Allen traded them some very nice bottles, figural bitters, for the Club House. I have spoken at length with Lou and Dorthy, and they always felt good about the deal they made with the Club House. Allen was excited to go to Bishop and pick up the bottle. He told me he got there the same time as Lou and Dorthy were coming home from a dig. 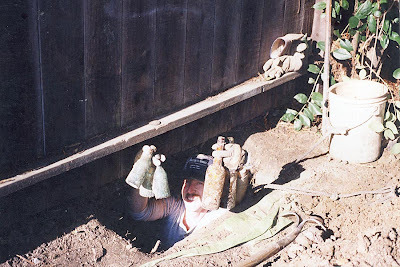 Lou opened the garage door, and brought in a couple of bottle boxes from that days dig. In the corner of the garage, on the cement floor, was a line of bottles that were still dirty - some with remnants of ghost labels. Embossed fifths, Blakes, Cutters, McKennas, and more than one of each! The amber fifths didn't warrant a cleaning I guess, green ones only need apply. Allen told me he nearly sh-- his pants when they reached into the boxes of that days dig and added three more embossed fifths, err beers, to the dirty line up. Lou and Dorthy have been gone for a number of years, wonderful people! The postman rings twice. Boraxburg is located pretty close to beer label town. The origination or historical context of the clubhouses are completely different. 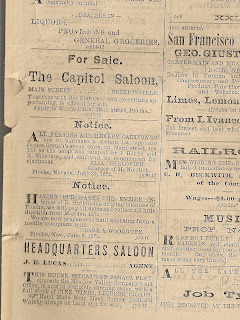 The famous bourbon was actually sold and consumed in Borax in 1873/74, Morrison actually had a saloon there that he supplied as was the custom of several of the early S.F. wholesalers. Several other broken ones have been found here. Beer label clubhouses were filled with beer from Boca Brewery, other breweries. 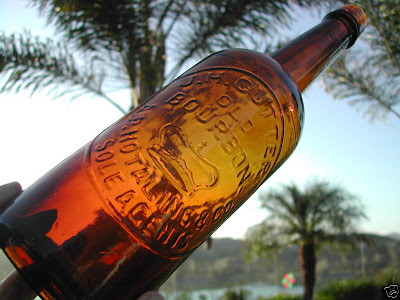 Empty bottles were in high demand as the bottled beer industry took off in the late 1870's. Empty whiskey bottles were a perfect container for the beer. Bottles from defunct companies, partnerships etc. found their way to bottle recyclers and then to breweries begging for anything that would hold beer, then shipped into the notorious beer label town, and other towns. Back to the postman - - - the old story was, that Frank led a group of diggers from the Reno Club into Boraxburg in 1970. A club dig as it were. After an hour of digging, the Club dig was over for Frank, he had two of them. I spoke with a early collector that knew Frank well and he told me that the story was total B.S. He said Frank was "an 'ornry old coot and wouldn't want to baby sit no bottle club diggers". He sounds like his old friend from Utah, Irlam B. Owen. I believe A.P. interviewed Frank back in 1997 or so, he might have the rest of the story. He was a postman. Sell a house, buy a boat. Do you know the way to San Jose? Darrell kept his Club House longer than any finder. I had a visit with him at the National Show in Pomona. He had spent the spring fishing in Mexico. Nice! Still digs like a steam shovel. Is there a nicer guy around. Think Reno Show and I think Don and Bonnie McClane. Don dug his in 1964. 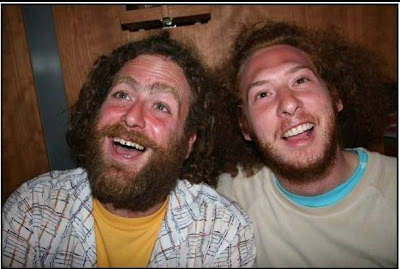 It later went to bottle dealer Eugene Fachin, then possibly to Bill Wilson, then to Doc Ritz, and finally to Robert Frank. Don told me that it came out of a deep 10ft privy. Two bottles in that big hole. A little unembossed blue med, and the CH. Took 3 sets of hands to hoist A.P. 's Three diggers partnered up on this find in the early 1980's. A J.F. Cutter fifth was found right along side the CHouse. A.P. has been back to the exact spot, but all that was left were some 1920's bottles and trash. Phil's finder. This bottle has been in captivity for a very long time. 'Al' has passed away years ago. Phil has the name, but 'AL' works for me. Check out the post titled "THE CLUB HOUSE CLUB" for the crazy story on this one. DO WE HAVE A NAME???? Owning two won't get you in, but having three different Club House fifths in your collection will. They were not all there at the same time, but both green examples were there, one since has left. Later, the amber example dug by Darrell D. entered the Schwartz collection. That is the total membership! Quite an elite group. Go out and make digging history! Utah Antique BottleShow and Sale. Redwood Multipurpose Center,3100 S Redwood Rd,Salt Lake City, Utah. 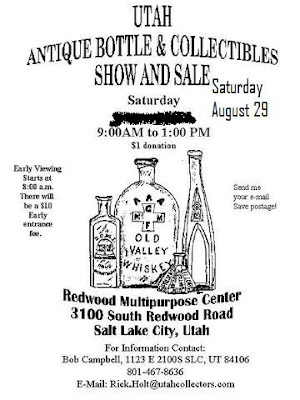 Here is the show information for the 2009 version of the Utah Bottle and Collectibles Show. It is a very small show, but has been ongoing for upwards of 40 years. We don't have an official bottle club in Utah, but the "bottle hobby" is alive and well in the Salt Lake area. 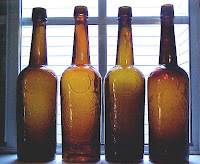 Most recently the bottle show has been put on by the "Utah Collectors" group. Check out their webpage: http://www.utahcollectors.com/ Not Bad!! If you are in the area ?? stop in and say hello. I know there are at least a 8-10 glob top collectors from Utah that are following this blog... part of the vast silent majority. I can guarantee you that there will be at least two tables at the show that will have fifths for sale. Plus all the stories, information, and other nonsense us glob collectors love to distribute. 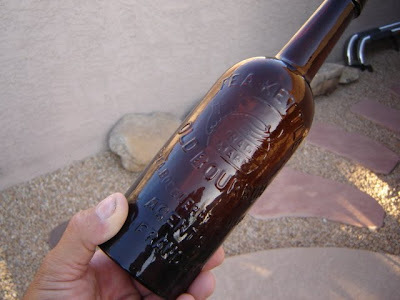 What's the "oldest" whiskey bottle in your collection? Not what you thought, right.? How many of you were thinking, "ok... I dont have a pontiled whiskey"? haha. I thought it would be fun for us collectors to reflect back on the glob top fifths and flasks that are currently in our collections and make two determinations....... First off, what is your fifth or flask that you currently own and have had for the longest time ?? (doesnt matter if you bought, traded, or dug it). How long have you had it? Second, if you dug a fifth or flask and still have it, which dug-bottle have you had the longest? How long, and why do you still have them?? Don't be afraid if it makes you feel as old as some as your bottles, that's not the intention here !The idea is to see why each of us has kept certain bottles longer than others, to reflect back,and also to kind of jog your memory to enjoy the reasons why, or how we acquired our "oldest" bottles. Like Andrew has so perfectly stated, any embossed '70s glob fifth is a thrill to dig. This Circle is coming out of a shallow pit in a S. Utah mining camp. It was the first bottle in view and I was a little too excited, yanked it before realizing it was surrounded by other bottles. Would have made a great "context" picture. Hard to believe that the darkish looking fifth in the shadows of the hole, turned out to be the one on the right and "better than just amber". That is worth a flutter, getting that first glimpse of green when you were just expecting... well, I don't know what to expect. My heart is usually racing full limit when I pull a glob fifth or flask and realize it is intact. This is a great hobby, keep the pictures and posts coming. 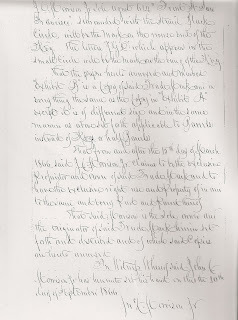 Please, sign on as a follower, and even better sign up as an author... lets hear about some of those fifths and flasks that have not made their way onto the blog. I will wait for a week or so to post my Hall of Fame list for the Club House. These two are not on it! Wait, A.P., did one of these guys dig your 'House'? Time to relax and take it easy. Since the Whiskey blog came online back in January of this year I have been wondering how much effect it would have on the value of the western fifth. By that statement I mean will all the hype and discussions about certain whiskies make them more desirable and thus more valuable? Seems to me that question is being answered almost daily on ebay. Take for example the Circle Cutter (Thomas 43) that just closed on ebay last week. Described as "real nice olive amber colored glass" and "There's a lot of green in this one boys" sold for a whopping $496.00. That's, in my opinion, about $300 more then it would have sold for before January of this year. Do ya think the old whiskey blog influenced the price of that "olive" fifth? Also on ebay this week is a Teakettle fifth with a starting price of $850.00. The Teakettle is one of the most desirable "common" western fifths out there and this example has yet to receive a bid. Teakettle's, right now at shows, are being offered in the $800 - $1500 range, depending on crudity. Why hasn't this bottle received a bid? The seller says it has "a pinpoint size stone with 2 microscopic tails". I for one, do not believe that this manufacturing flaw is the reason it doesn't have an opening bid. Heck, the Teakettle has yet to be posted or discussed on the WESTERN GLOB TOP WHISKEY site. All it would take is just a small post on the site and a few comments and this bottle could go through the roof. Another Circle Cutter listed on the bay (Thomas 44?) closing on Monday the 16th is sitting at $185. Described as "Killer Light Honey-Amber Color with some nice transitional shades of medium to light amber throughout (as seen in the pictures). Decent whittle, solid strike, crude mold seams, and a nice overall example of sparklematic Western-blown glass! Nice applied top featuring a crude dip in the glass along the top of the ridge". With a day left of bidding I would imagine this bottle will go way over $200. The only thing that bothers me about this bottle is the palm trees in the background. For some reason my mind does not put together the old wild west whiskey fifths with palm trees. I know, its me, but I just can't get by this. And then there is The Bottle Vault. A Circle Cutter ( Thomas ?) he had listed on ebay just sold to some gambler for a hefty $260. 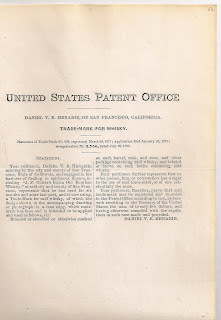 His pictures and description of the bottle left a little to be desired: "You are bidding on an old and authentic nice amber glass handblown Gloppy Top J. H. CUTTER OLD BOURBON whiskey bottle, from A P HOTALING & CO SOLE AGENTS (of SF CAL). This classic Western Whiskey bottle stands 12" high". No mention if its a 2 or 4 piece mold or if it has A No1 on the reverse. Pretty sketchy description for this old collector to lay out $260. If you are looking for that special western fifth its time to bite the bullet and shell out the cash. Waiting until after it hits the whiskey blog, as a post, is only going to cost you more of your hard earned money. "There's a lot of green in this one boys"
Here is one member of the California Club House Club - and the story of his bottle. Just a quick mention of Lot #98 the Old Bourbon Castle Whiskey(t-22). This appears to be a decent example of this bottle, this bottle is often found with a very strong strike and good whittle. Again, check out the video and description on the American Bottle Auction site (see our links). Just as a correction to the printed catalog, it is listed as an "A.T." or an applied top. I see that the catalog is using the initials a.t. or t.t. -- tooled top. Over the years collectors have identified these as T.T.T. or transitional tooled tops. The Auction has corrected the 'top description' on the web site description. 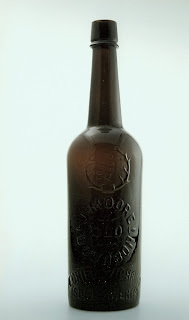 This bottle is found with a true applied glob top, but they are not common. I'm not trying to nit-pik the Auction, but I want everyone to be aware of differences. I wish the true glob Castle(t-22) had as good of a strike as the "transitional". The Auction price estimates are certainly in line with the historical price the "transitional" has sold for. I guess you could expect to pay more for a true glob top. wasn't happening and my patience was running out. accessible from this one yard and all from the 1870s. embossed early 70s 5ths and 29 early blob sodas. Cutters & 1 S.H.M. What a friggin great hole it was. like it would last forever. have a better look at it, item #270438875628. 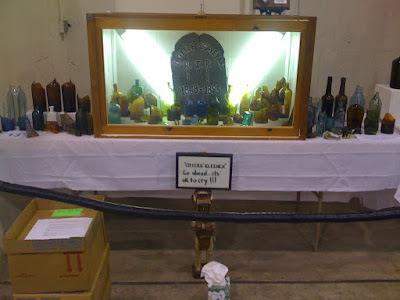 There were some great displays at the show: George Washington Historical flasks, unembossed colored Western bottles, hutch sodas from the various U.S. States, Demijohns and Carboys, Indian wicker-wrapped bottles, and a "crier" display that I took part in (along with some key pieces of glass from Super-digger/collectors, Lawson & Quinn). $350 -- Light Old-amber, Variant 4, TRADED for a medium-amber J. Moore w/ a repaired top. All appeared to be damage free, fairly decent to good examples, but I didn't notice any of them actually selling. I did not see any of them sell. $1,600 (nice dark-amber example with excellent strike and huge top) -- ended up selling/part of a multi-bottle trade. Once again, these are just a few of my simple observations from the show. I can think of about two to three times this many whiskies that I saw for sale, but I am not going to beat a dead horse here. To be honest, I can't really remember what they were all priced for, what the full damage-inspection report is, and which ones traveled back home with the dealer or with a proud new owner. To put it simply, it seemd that about upwards of 85% or more of the whiskies did not sell. Many of these were familiar bottles with the same price tags, with a few fresh ones still managing to surface. If you didn't go, I believe you certainly missed out! I can understand the Early Bird fee seemed a bit steep to some (plus travel & lodging arrangements)....but this kind of show only comes around every two years....and who knows when the next one will be staged in SoCal?? I hope to see those of you who didn't attend the Pomona show at the Downieville, Santa Rosa, or the Auburn show(s)!